Baking becomes a cinch once you've learned these essential skills. Once you've picked them up you'll know them for life - I learned how to separate eggs by watching Delia Smith when I was aged ten at most. I've also given a list of essential equipment for your kitchen, which you'll need if you want to bake on a regular basis. Don't worry, baking is not rocket science. In my opinion, decorating is an art and baking is straightforward as long as you follow the recipe you've been given. Once you build up some confidence then you can experiment a bit: change an ingredient here and there or add your own to make a recipe yours. Saying that, with standard cakes you must maintain the 1:1 ratio with flour, butter, sugar and eggs, or it won't work. Sweetapolita has also created a very comprehensive list of cake baking tips here, which uses some methods that I don't see a need for, but they may work for you! There are two types of oven: fan-assisted and conventional. Fan ovens cook faster because the fan makes sure that the hot air moves around the oven, whereas a conventional oven relies on convection heating (where hot air rises to the top of the oven and falls as it cools) to move air around the oven. As a general rule, take 10% off either the time or oven temperature in order to adjust a recipe's cooking time to your fan oven. Unless your cake has cream decorations, I would strongly advise against putting it in the fridge as this will dramatically shorten its lifespan (the same goes for bread). I normally just leave my cake out on the kitchen worktop so people can see and eat it, but if you prefer to store it away make sure it's in a cool, dry place and, of course, out of reach of pets! Biscuits are generally stored in a tin, but, as with my cakes, I tend to leave them out on the worktop for a few days before storing them away so that people can get their fill of them. This is how your creamed mixture should look. Put the sugar and butter into a bowl. 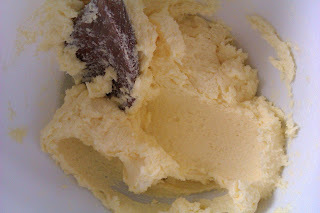 Take a wooden spoon and mash the butter into the sugar until there is no loose sugar in the bowl and the mixture has taken on a fluffy, creamy appearance. 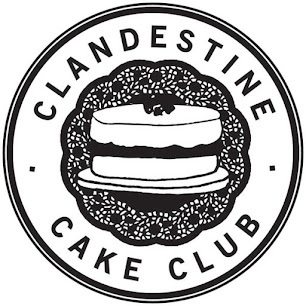 A soft dropping consistency is an essential property for a cake mix because it ensures that the baked cake is moist, which, as anyone who's eaten dry cake knows, is very important. A soft dropping consistency can be tested for by taking a spoon, dipping it into the mixture and pulling it out at an angle so that the mixture could fall off it. If the mixture plops easily off the spoon you have your soft dropping consistency. Be careful not to make the mixture too runny (i.e. almost liquid) as it will mean that the cake will take longer to cook and may not cook properly at all. To create the soft dropping consistency, add small amounts of milk to the mixture, stirring and testing each time, until you have the correct consistency. Take a skewer - you could buy a fancy one or just use a knife - and poke it into the middle of your cake. Pull it out: if it comes out clean with no mixture then the cake is ready; if not then it needs a little longer in the oven, so try the cake again in 5-10 minutes. Crack the egg over a bowl, but make sure that one half of it is held so that the yolk can't fall out of it. Tip the yolk between the two halves of the shell until there is no egg white left in the shells, then deposit the yolk in a different bowl. Some recipes only call for the egg whites or the yolk, so it can be a challenge to decide what to do with the remainder of the egg. Nigella Lawson says that egg whites or yolks can be frozen for up to two weeks, or you can use them to make scrambled egg, for example. Soft Peaks: peak flops over and mixture on whisk flops from shape it was in when pulled out of mixture. 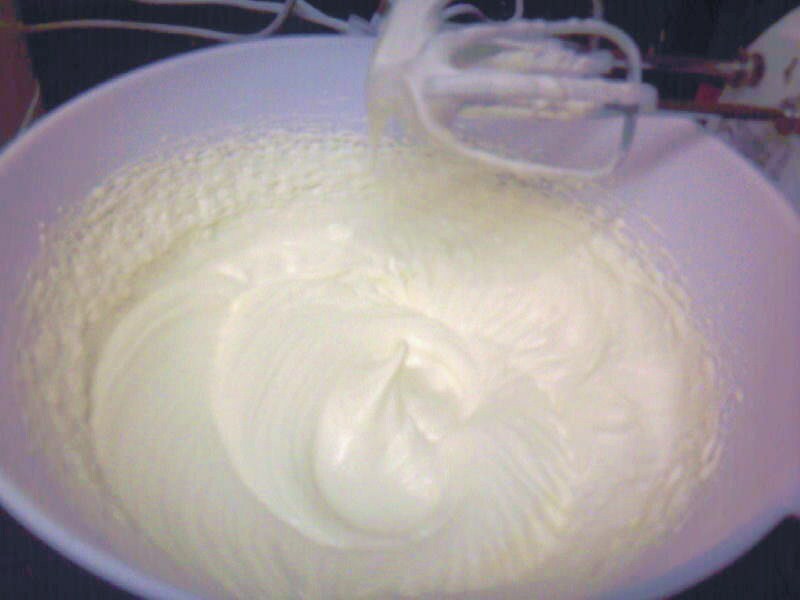 It is possible to whisk by hand, but my arms are too weak and I have too little patience for that, so I use an electric hand whisk. It is also possible to get a food processor with a whisking attachment so that you can go off and do something else while it does all the work for you - if you do this I'd advise at least keeping an eye on it because you don't want to over-whisk it. Cream of tartare or lemon juice add acidity to the egg whites, supposedly making them whisk to a greater volume. I don't really see much difference when I add either to my egg whites and sugar so I tend to just leave them out, but the choice is yours. Stiff Peaks - peaks don't move and stuff on whisk stays in shape it was when you pulled it out of the mixture. Put your cream or egg whites into a bowl, put the electric whisk into it and turn the whisking onto full power. Move your hand around a bit so that the cream/egg around the edges gets the same attention as the stuff in the middle, especially as it gets thicker and moves less fluidly. When the cream/egg is so thick that the whisk starts to leave trails in the cream, stop the whisk and pull it out. Examine the peak left by the whisk: does one even form? Does it flop over at the top? Does it stay in the shape you left it in? If a peak doesn't form, you need to whisk for longer. If the peak flops over at the top, this is called a soft peak; if it stays in the shape left behind this is a stiff peak. If you're interested in the science behind making meringue, take a look at this article. Folding is a method used in baking to gently mix two things together, often to ensure that air is kept in the mixture, for instance in a chocolate mousse you must fold the whipped egg whites into the chocolate mixture to ensure that the mixture doesn't go flat, which is what standard mixing techniques would cause. To fold, simply take a metal tablespoon and put it in the mixture. 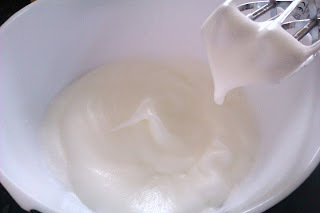 Gently pull it back out, taking the mixture at the bottom with you, and carefully 'fold' this mixture over the top by moving the spoon over the bowl (do not drag it along the surface). Repeat this process until the substances you're mixing are well combined. You'll know you're successfull if you can still see that the mixture has air in it. Make sure your hands are as cold as possible by running them and/or the veins in your wrist under a cold tap for a few minutes. Reduce the time that the butter is in contact with your hands by picking up the ingredients, rubbing them together quickly and dropping them back into the mixture. Pick up some of the flour and butter using only your fingertips and rub it together for a couple of seconds maximum, then drop it back into the mixture. Keep doing this, making sure that you dig right down to the bottom of the bowl, until all of the flour and butter has combined to look like breadcrumbs. I've probably forgotten something, so I'll be back to edit this post soon enough I expect. Check my regular posts for notes on updates to this one. Also, if you have any questions that you want answered or you want to know how to do something, don't hesitate to ask.